THE GREATEST FIGHTER OF ALL TIMES! 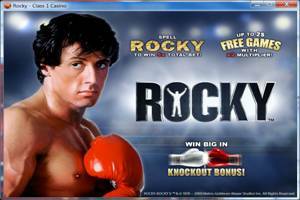 Get into the ring and battle Rocky's greatest adversaries in our knockout bonus. Feel the sweat in free games, and spell »ROCKY« to win a cash prize. Get in the ring with Sylvestor Stallone and win! Players can gamble their winnings to win double or half of a win. 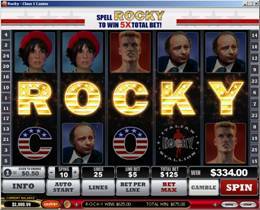 When the letters appear in that order on consecutive reels from left to right, regardless of paylines, they align to spell “ROCKY” and the player wins 5X total bet. Feature available in main game and in Free Games. Rocky will fight the chosen opponent in a 10-round match, featuring clips from the original movies. 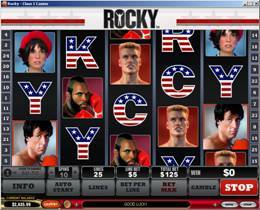 For every round Rocky wins, the player wins 3X total bet. All matches end with a knockout in Rocky’s favour. In some matches, a knockout occurs earlier than the 10th round. All following rounds are considered to be won by Rocky. The Knockout Bonus cannot be triggered in Free Games.